“Race Pattern” means swim similar relative splits as you plan to swim in the race. 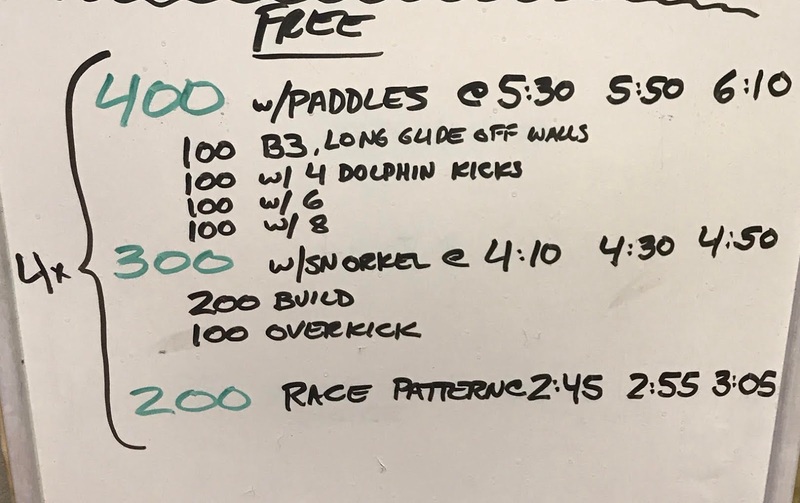 This aerobic freestyle set mostly called for moderate pace swimming, but we were looking for some very specific technical details. We did this set recently on a day where most of my group was at a high school meet. This allowed me to get splits on all 6 people for each 50 of each 200. I recorded the splits on a dry-erase board, and after each 100 easy we reviewed their splits. Increasing their speed within each set of 3 amplified the learning curve. We learned a lot doing this set. Periodically we will get times on the broken 200’s in total as best we can…swimmers you are to know this as well if asked! Partner-up (getting half OFF deck, and half OUT of the water): One swimmer swims a 100, this is ALWAYS done as an EZ first 50, then an ALL OUT SPRINT second 50, to mimic 2nd, 3rd, and 4th 50’s at 200 GOAL Pace, but go ALL OUT. As your partner swims, you do dryland on deck which ranges from sit-ups/planks/jump rope/push-ups/med ball tosses/med ball slams. Switch for 20 minutes in duration, all are to get in at least 6 x100’s apiece, let’s see who can get as many or more than 8 x 100’s. 1 x 200 ALL OUT in your specialty 200 event, individually in heats. One per lane, teammates will give you your 100 splits! This was an effort to help some of our swimmers “figure out” the 200 free. We followed up with a set specifically designed to practice for this event. That set will come in a later post. The Swimming Wizard’s goal is to publish at least one set, practice, or idea EVERY DAY for all of 2016! To keep it interesting, we need your help! Click here to help us achieve that goal by submitting one of your sets! We had great success with the set below. Red portions are all based around goal 400 IM pace based on our current actual splits. We used our pace cards to determine these splits. 4 x 100 IMO @ 1:35. Fly pace plus 5, Back, Breast, Free pace plus 2. All from a push. Back, Breast and Free pace were defined as equal to the last 100 of the swimmer’s best 200. It actually went pretty well. Backstroke was a little off for everyone while breaststroke was a little faster for everyone. 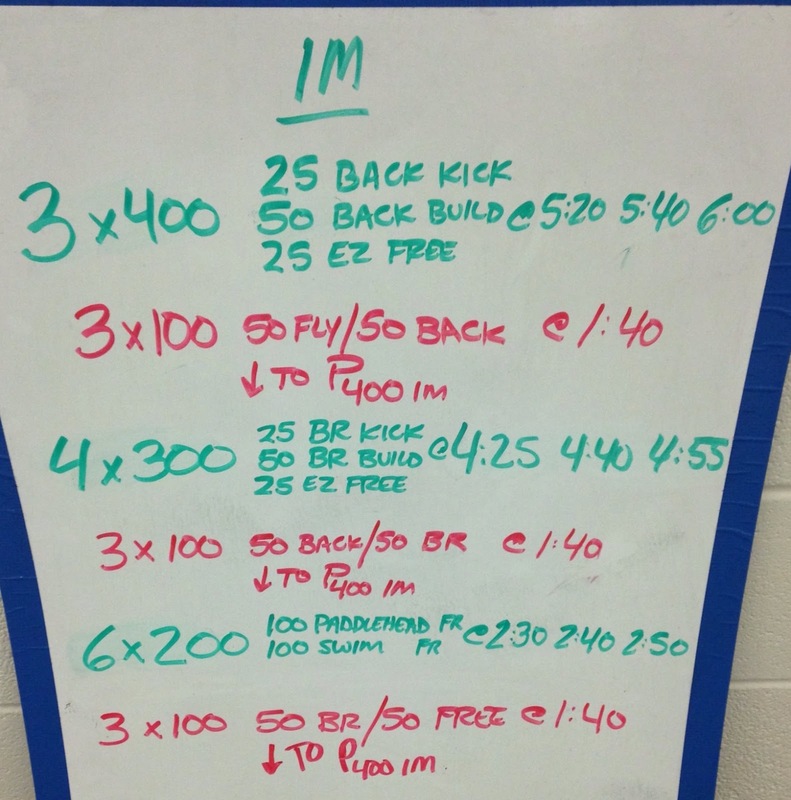 I gave this set (in short course meters) to my distance swimmers recently. The idea is predicated around Russell Mark’s observations on pacing the 1500 free at the elite level. He has observed that the very best milers have tremendous front and back end speed but swim at a very consistent pace in the middle. This set rehearses that concept. We start off with a 50 pretty fast (near 200 pace) and then follow up with a 100 strong (2-3 seconds slower than 400 pace) and then repeat three consecutive 400s at the same exact speed. 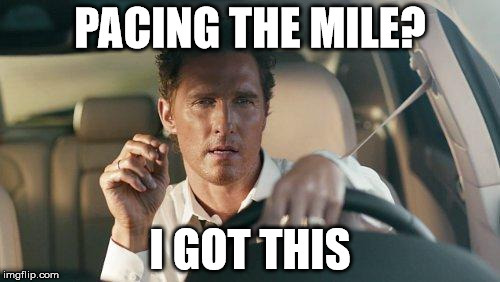 Then repeat the 100 and the 50 to finish a total of 1500m. Athletes take 20 seconds rest between each swim, meaning their total built-in rest is 2:00 (this makes it easy for determining their swimming time after the fact). We did a little backstroke for recovery and repeated the broken 1500 twice, trying to descend these repetitions mostly by making our 400 times faster. Finally, we finished with a straight 1500. This was icing on an already tough set, but we saw some really good times and I was very pleased with the effort. As we go through the set I like to remind the kids that adrenaline will help carry them on the first segment of their race and that they can take the time to really focus on their stroke mechanics and catch point, then use the drop segment to play with an increased tempo. I really like to emphasize this on the first set so when we get to the 200 set they can properly swim the 1st negative split 100. I really enjoy your site and have really found quite a few of the workouts inspirational and thought I would try to contribute. Thanks for all the sharing. You can use this set to build up race habits and teach the desired race pattern. We put a watch only on the 4th 200, 100, and 50. #4 – 200 for time – put it all together! This set will bring the pain. Can you take it? 3 x 400 descend 3-5 seconds each 400 to a strong effort on #3. Remember your times. 3 x 100 descend 1-2 seconds each 100 to a strong effort on #3. Start at least as fast as your pace from the 400s. Remember your times. 3 x 50 fastest possible average. Start at least as fast as half of your fastest 100 from above. Make sure your last one is your best one and ends with a great finish. Don Swartz and Ken DeMont over at Swim Coach Direct had an interesting post Sunday on race splits and training for the 200. I highly recommend it. Their post encouraged me to share with you a tool we use to help swimmers on our team establish race paces for training purposes. Click here to download our Excel spreadsheet for determining goal paces. 2. Enter a swimmer’s goal time in the C column. Do not use any punctuation. For instance, for a goal time of 24.99 in the 50 free, type 2499. For a 2:28.50 in the 200 breast, type 22850. 3. The sheet should automatically compute pace times for you. ‘Pace’ means the swim is from a push. ‘Start’ means the swimmers goes off the blocks (or from a start for backstroke). The sheet computes different pace values for different events based on what I deemed the most useful information. A 15m start time is of little consequence in the mile, but could come in handy in the 100 fly. 4. Print out the pace card and take it to practice! The sheet is based on the assumption that a swimmer will swim an even pace for every length after the 1st 25. For freestyle, the difference between the 1st and 2nd 25 is 1.7. For fly, the difference is 2.0, for backstroke the difference is 1.0, and for breaststroke it is 2.5 seconds. The C column is cross-hatched and the goal time is in gray in order to keep the swimmer’s focus on the race pace rather than her goal time. Enjoy – let me know how it goes!